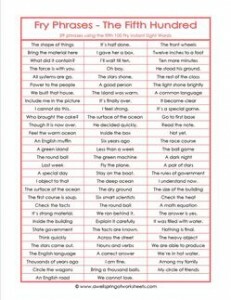 Fry Phrases – The Fifth 100 lists 89 phrases using the fifth 100 words from the Fry words list. Examples are: less than a week, I cannot do this. Circle the wagons. The force is with you! Go to this page to see all the Fry phrases in this set.